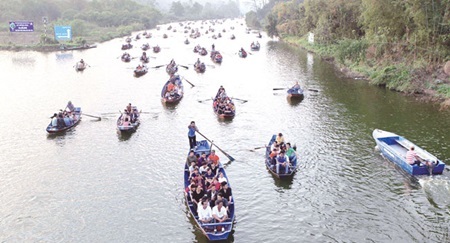 As many as 50,000 people flocked to the holy site in Ha Noi’s suburban My Duc District on the opening day of the increasingly popular three-month long Huong Pagoda Festival. At precisely 9am, Venerable Thich Minh Hien, head monk of the pagoda, began a ritual ceremony. “Over the last few decades, the festival has become a favourite spiritual and cultural activity of Vietnamese people, and even attracts foreign tourists,” he said, estimating the number of opening day attendees at 50,000. The annual festival, the longest-such event in the country, opens on the sixth day of the Lunar New Year. As it welcomes the increasingly large number of pilgrims and tourists, the festival’s organizing board has been trying to offer better services, as also pay heed to the pilgrims’ sensitivities. “This year, we have strictly banned the display of raw meat by restaurants and other eateries, which had annoyed many people in previous years. We will strictly fine violations, confiscate the meat and even close the establishment,” said Nguyen Van Hau, vice chairman of the district’s People’s Committee. The festival’s organising board has also set up a market-watch team that will carry out regular checks to ensure that restaurants and other eateries maintain food safety and hygiene. To protect the Buddha statues and other objects of worships, pilgrims this year are not allowed to light incense sticks and joss papers. Although the festival officially opened yesterday, tens of thousands of people have headed to the pagoda since the second day of Lunar New Year, which this year fell on February 20. The price of admission to the pagoda has remained unchanged at VND85,000, including boat transportation on the Yen Stream. Around 5,000 rowing boats are docked at the Duc pier on the stream, ready to transport visitors to the main shrines. The boat ride itself is a huge attraction as it travels through striking mountain scenery. Built between the 18th and 19th centuries, the Huong Pagoda complex features a large number of shrines and natural caves filled with marvellous stalactites and stalagmites. Located at about 60km from downtown Ha Noi, the pagoda is is one of the most famous cultural and spiritual tourism destinations in the north of the country.